1. Preheat the broiler. Lightly sprinkle the salmon with salt and pepper. 2. Broil the salmon just until done (still a little pink in the middle), which should be 4 to 5 minutes on each side depending upon how thick it is. Remove the salmon from the broiler and let it sit 2 or 3 minutes. 3. Here is how you make the sauce. In a medium sized enameled or stainless steel or non stick frying pan, melt the butter and cook the shallots/onions for about 5 minutes over medium-low heat, stirring often. 4. Add the vinegar, turn up the heat, and cook rapidly (about 2 minutes or so), stirring constantly, until the vinegar has practically evaporated. 5. Off the heat, stir in the grapefruit juice, mustard, and cumin. 6. Put the pan back on low heat and cook for a minute or so, stirring constantly, until the sauce has thickened somewhat. Stir in the chopped coriander leaves. 7. To serve, put ¼ of the sauce (including the shallots/onions) on each of four warmed plates and spread out. Put ¼ of the salmon on top of the sauce. Sprinkle the top of the salmon liberally with coriander leaves. Garnish each plate with ¼ of the grapefruit segments or slices (you will want at least four grapefruit segments for each plate). Serve with crusty bread and good white wine. Source: Ruth Bader Ginsburg. (2015). The Biography.com website. 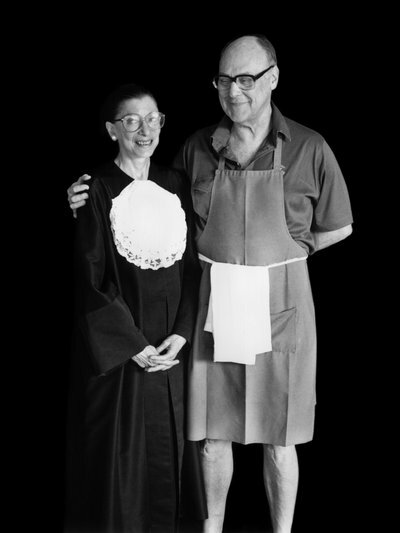 Retrieved 12:12, Mar 16, 2015, from http://www.biography.com/people/ruth-bader-ginsburg-9312041. This entry was posted in Main course and tagged dinner, Marty Ginsburg, Ruth Bader Ginsburg, Salmon, seafood by idoalready. Bookmark the permalink.